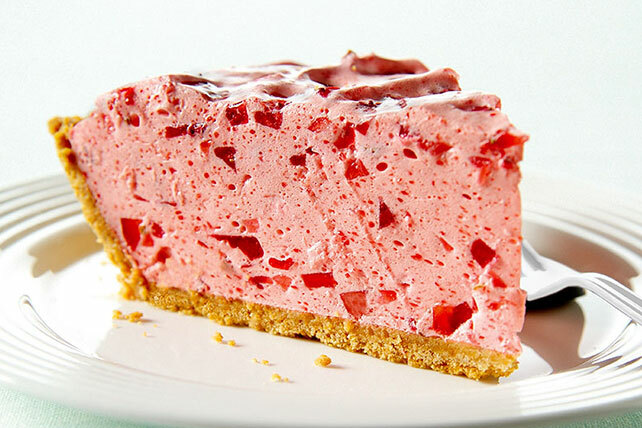 Are you a fan of creamy, dreamy strawberry chiffon pies? You can have this one whipped up and ready for the fridge in just ten minutes. Stir boiling water into dry gelatin mix in large bowl at least 2 min. until completely dissolved. Add enough ice cubes to cold water to measure 1 cup. Add to gelatin; stir until ice is completely melted. Stir in lime zest and juice. This pie is great for a get together since it tastes great and serves 8. Garnish with thin lime wedges and/or additional grated lime peel just before serving. Makes 8 servings, one slice each.